The history of Atari is a fascinating story of innovation, business success, and business failure. There must be case studies on Atari that have been used over the years to teach in business schools across the country. I would love to get my hands on some of those to see what the lessons are and how they are presented. I have several posts on books that go through the history of Atari. I highly recommend those. 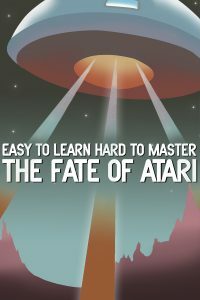 I also recommend the documentary “Easy to Learn, Hard to Master: The Fate of Atari” that was directed by Tomaso Walliser and Davide Agosta and partly funded by a Kickstarter. This history of Atari is well done and features interviews with lots of Atari personnel including Nolan Bushnell, Al Alcorn, and Joe Decuir. They tell the story of Atari from its inception as the first coin-op video game company with Computer Space and Pong and later the developer of the Atari 2600. The documentary does not cover the Atari 8-bit or 16-bit home computers or its recent history and ends just before the sale to Jack Tramiel in 1984. Watch “Easy to Learn, Hard to Master: The Fate of Atari”. You can find online on YouTube, Amazon, iTunes, and others. The price varies but is generally between $2 and $12 to rent or buy. I always learn something new when I watch a video or read about the history of Atari. I highly recommend this documentary although some reviewers think the narration could have been better. I didn’t really notice since much of the content is interviews with former Atari personnel. Here are the Amazon reviews.